Feb. 21, 2014 – 3-4:30pm in EB2-94 – master class with John Noreyko – tubist from LA, freelancer, jazz musician, entrepreneur. He’ll talk about “making it in the music business” and improvisation. 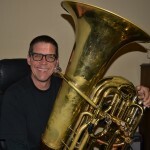 Feb. 23, 2014 – 2:30pm in Katzin – concert with John Noreyko – and a 6 piece tuba euphonium jazz ensemble with rhythm section.